Chris Matthews: Do Republicans Oppose Obama Because of His Race? Chris Matthews on Friday actually asked a GOP Congressman if Republicans oppose President Obama because of his race. On the 5PM installment of MSNBC's "Hardball," Matthews brought on Rep. Bob Inglis, the Congressman from South Carolina who easily lost his primary fight in June to Tea Party candidate Trey Gowdy and has been badmouthing his Party ever since. Early in the conversation, Matthews asked, "What is it that`s gotten into your Party`s water supply, the Republican Party`s water supply, that makes them strangely hostile to the president, not just against his policies, but personally? Is it race?" 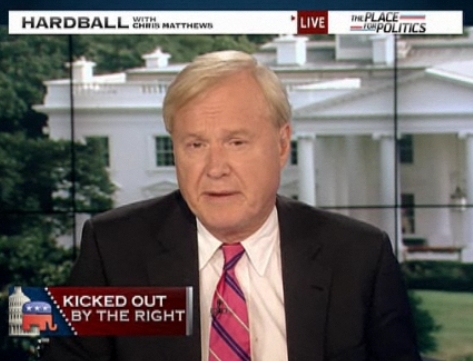 CHRIS MATTHEWS, HOST: Welcome back to HARDBALL. After voting for TARP and telling voters not to listen to Glenn Beck too much, South Carolina Republican Congressman Bob Inglis was outvoted in his primary this year. Now he`s offering up some very honest advice for his party and some very scary stories from his time on the trail. Here`s how Mr. Inglis described one campaign donor meeting to David Corn at "Mother Jones" -- quote -- "They say, `Bob, what don`t you get? Barack Obama is a socialist, communist, Marxist, who wants to destroy the American economy, so he can take over as dictator. Health care is part of that, and he wants to open up the Mexican border and turn the United States into a Muslim nation.`"
Congressman Inglis joins us tonight from Greenville, South Carolina. Well, that was a funny conversation. Somebody actually thought that the Muslims would be pouring over the Mexican border. The Rio Grande protects us from Islam. These people have got a problem. REP. BOB INGLIS (R), SOUTH CAROLINA: I guess so. It`s -- I think it`s generally not seen as a Muslim nation, but -- Mexico isn`t. MATTHEWS: Well, what is -- what is -- let`s talk about the conspiracy theories. What is it that`s gotten into your party`s water supply, the Republican Party`s water supply, that makes them strangely hostile to the president, not just against his policies, but personally? Is it race? MATTHEWS: I can`t resist asking this. I got to ask this question. If we had about a million Heidi Klums trying to cross the border, the Mexican border of the United States, you know, the gorgeous blond from Germany or whatever, do you think that would be a problem with immigration right now, or is it really just ethnic? The people from a different ethnic background. If Heidi Klum, by the million, was trying to cross the border, I figure a lot of guys would be down there welcoming her personally. What`s your view? I want to make this a little ludicrous because I think it`s obvious it`s ethnic. And I want people just to admit it. So, in Matthews' distorted view, Republicans oppose Obama's policies because of his race, and Americans that are against illegal immigration only feel this way because those coming across the border are Mexican. And this guy has his own show on a cable news network. Tough to believe, isn't it?